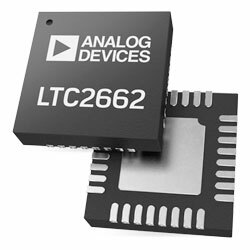 Analog Devices LTC2662 Digital to Analog Converter is a five-channel, 16-bit/12-bit, current-source DAC, offering five high-compliance current source outputs with guaranteed 1V dropout at 200mA. The DAC supports load voltages of up to 32V. The device is provided in eight current ranges, programmable per channel, with full-scale outputs of up to 300mA. The channels of the device can be paralleled to provide for ultrafine changes of large currents, or for combined outputs of up to 1.5A. A dedicated supply pin is provided for every output channel. Each one can be run from 2.85V to 33V, and internal switches enable any output to be pulled to the optional negative supply. The device incorporates a precision integrated 1.25V reference (10ppm/C maximum), with the choice to use an external reference. The SPI/Microwire-compatible three-wire serial interface works on logic levels as low as 1.71V at clock rates up to 50MHz. The device is provided in a compact 5mm x 5mm QFN-32 Pb-free Package, and is offered in commercial (0C to 70C), industrial (-40C to 85C), and automotive (-40C to 125C) operating temperature grades. typical applications include tunable lasers, semiconductor optical amplifiers, resistive heaters, current mode biasing, and proportional solenoid drive.